Is It Anxiety, Or Am I Just Overthinking? I felt the blood rushing to my head. My neck felt pins and needles, and I was feeling like my loose tee shirt was too warm. It was my first time entering a store I'd never been to before, and I didn't know what to expect. There was a water fountain at the entrance, and I wasn't sure if that meant I should have a drink, or if I was allowed to give some to my son. He too saw the water and insisted on drinking it. What if he spills it? What if I spill it? What if he spills it on something, and it's a $400 painting. My child is crying and tears well up in my eyes too. The fear-filled emotions and negative feelings anxiety forces into your brain is the root of all of it. They're linked for sure, but overthinking is absolutely not social anxiety. Let's walk through it together. Social anxiety is pretty all-encompassing. There are a lot of symptoms of social anxiety, but each of those symptoms on their own is not social anxiety. First, we will talk about shyness. You can be shy, or suffer from shyness and social anxiety but they can also happen separately. The difference is a bit tricky. Shyness is more about being and feeling vulnerable around new people and eventually opening up. Or you could feel fine being around people, but you don't have to talk to them. Anxiety is fear. Social interactions are hard, even something as simple as asking if the water at the front of the store is for everyone. With social anxiety, it's not talking to people it's being around them at all. It's incredibly common to have social anxiety and overthink. I would even say most people with social anxiety do overthink. Some people overthink things but can calm themselves down enough to handle social situations. With anxiety, it's much more difficult to handle even if you aren't overthinking too much. Your thoughts get the better of you with overthinking and you get wrapped up in what could happen and then those feelings lead you down the anxiety rabbit hole. When you can identify how it's starting, you can find a way to reduce your anxiety. Overthinking can lead to worsened social anxiety symptoms so easily. This generalized fear of being around large groups of people can be exacerbated quickly with this overthinking mindset. Worrying about what others say, think, or do can be debilitating. This is where panic attacks start. I like to take deep breaths and try to ground myself to the situation. At the store that day, I focused on my son and repeating his feelings back to him. He simply wanted to be in the cart, and I was asking him to walk. By focusing on the things you have control over you have a much better chance of working through it. On days when it's too much, it's okay to walk right out of that store and return another day. 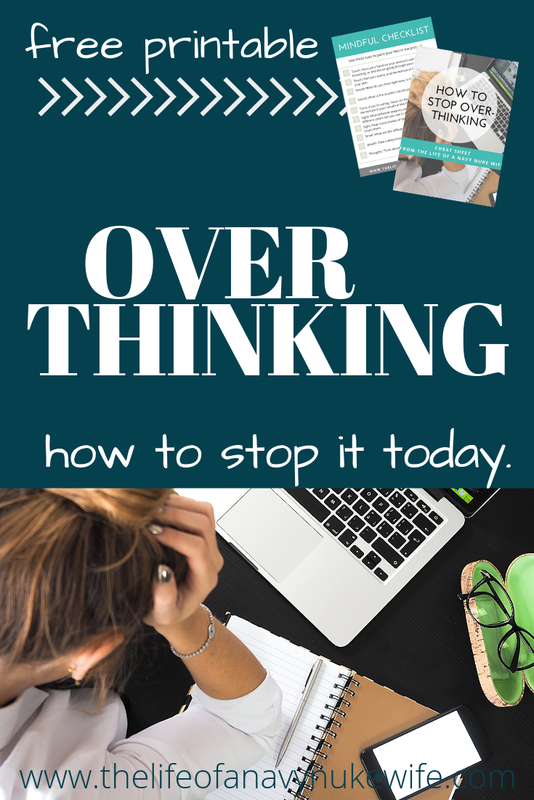 What ways do you overthink? Beth Ann is a mom to 3 crazy hooligans, and a wife to one (mostly absent against his will) sailor.